Mission: To educate and socialize preschoolers with the love of Christ. Vision: To be the preschool of choice in the Cedar Rapids area. Purpose: Our purpose is to help your child develop physically, emotionally, socially, spiritually, and cognitively. 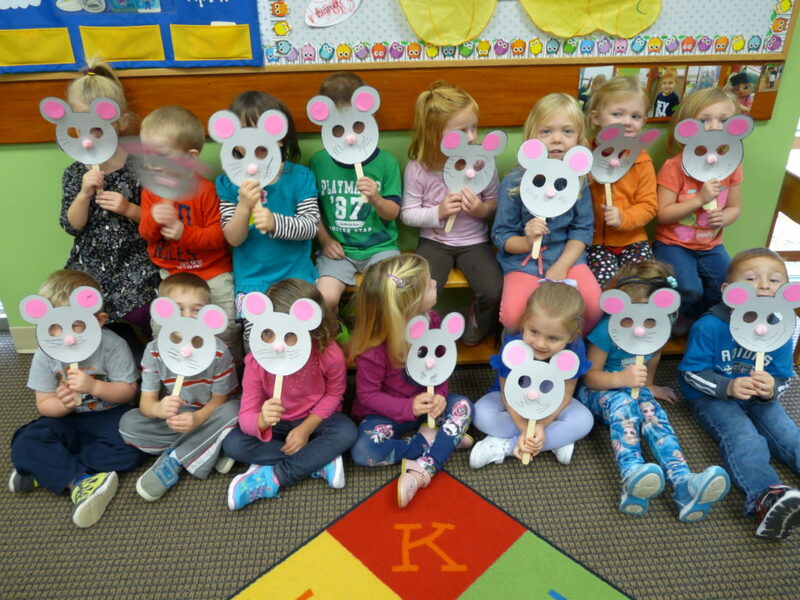 Our preschool aims to build a solid foundation for Kindergarten and Alternative Kindergarten. Some of our main goals for our three year old programs are: Teach each child that they are a special gift from GOD. Teach basic social skills such as body basics, waiting turns, respect for others, and general hygiene. Hygiene includes: covering your mouth when you cough or sneeze, washing your hands after using the bathroom, using a tissue and disposing of it himself/herself and then cleaning hands with soap and water or using hand sanitizer, keeping fingers out of the mouth, etc. We start a basic foundation for name recognition, colors, shapes, counting, and singing ABC's. We promote self-help skills i.e. ; hanging up coat, putting on coat, starting to zip/button, putting on hat/mittens/gloves and bathroom needs. Good social skills are the perfect foundation for building academic skills. Our four year old program builds on our three year old program. We solidify the social skills, have more of a focus on academic skills such as practice writing his/her name and introducing the letter of the week program. This program includes listening for the sound of the letter and practicing writing the letter. Math is taught through various approaches. The children count each day and play games to develop math skills. Some math games include counting, sorting objects and placing objects in categories. These techniques are very useful and the children learn so quickly. Language Development is extremely important for young children. We always have many discussions about different subjects, flannel board stories, poems, finger plays, and most importantly, books. We read books to the children every day. Dramatic play and music and movement encourage free expression and also allow the children to use their imagination. We give the children many opportunities on a daily basis to use the puppets, dress up clothes, blocks, and many others. We use music to teach the children their alphabet, numbers, shapes, days of the week, and the months of the year. Science experiments help children explore their surroundings. We discuss bugs, animals, rocks, trees, flowers, weather, and much more. Physical Development is also included each day through using large muscle play on our playground or the children will play in the activity room. Our goal is to prepare your child for Kindergarten or Alternative Kindergarten. In addition to the curriculum above, this program is perfect for 4 year olds that are ready for the challenge of 5 days a week, as well as the younger 5 year old that is not ready for an all-day program at the public schools. Our focus will be preparing your child for the challenges of an all-day Kindergarten class. Our smaller class size is a bonus! We can help you decide if this is a good option for your child. Click the download button to view information and fees for the 2018-2019 school year. Click the download button to view information and fees for the 2019-2020 school year. All of our staff members have extensive experience working with young children and are dedicated to providing the best care and learning environment. We feel each child is a special gift from GOD and deserves individual attention and care. Every staff member receives ongoing in-service training through staff meetings and workshops held throughout the year. Most of our staff have worked for us for several years. All of our employees have had state and federal background checks. They are trained in CPR, First Aid, Mandatory Abuse Reporting, Essentials Training and Universal Precautions. Leslie joined the Noah’s Ark Preschool staff in 2003 and became the Director in August 2005. She is very passionate about Noah’s Ark and being part of this outreach ministry at Cedar Hills. Her favorite part of her job is connecting with families in the community. Leslie and her husband Jeff have been Cedar Hills members since 1999. They have two daughters, Carly and Kelsey. When they are not busy with sports, school, and church activities the family enjoys camping. One of Leslie’s favorite Bible passages is Matthew 7:1-5. Ready to apply? Stop in to pick up an application or download it here.